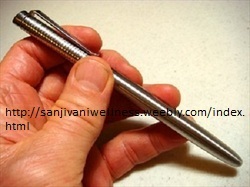 Nano wand - For those who prefer complete wellness without any supplements!! The Nano Wand is a natural energy generating device. The energy created specifically rejuvenates molecular structures in all liquids. The molecular structure causes any liquid to become more hydratious, taste better and extend shelf life. Placed in a fridge, the Nano Wand’s energy frequency permeates the fridge; all liquids, meat and fruit will taste better and have extended shelf life. The renewed molecular chains are similar to those found in healthy natural spring water. Like fruit and vegetables, the body slowly also loses molecular chains as we age. They can be re-energised at a molecular level to provide energy, using the Nano Wand. The hydratious nature of water is important to wellness. Molecular structured water carries improved oxygen flow to the Like fruit and vegetables, the body slowly also loses molecular chains as we age. They can be re-energised at a molecular level to provide energy, using the Nano Wand. The hydratious nature of water is important to wellness. Molecular structured water carries improved oxygen flow to the blood, assists in detoxification of free radicals, improves liver detoxification, and improves nutrient take up by the body. The natural energy of the wand improves sleep patterns when placed under the bed and improves the positive chi energy of the body when worn or carried in a bag. Energizes the liquid we drink, and food we eat by increasing the potency. Neutralizes the harmful elements (energetically) from the liquid we drink, and the food we eat. What is AM- Wand made of? Technically engineered natural minerals are fused and structurally bonded together at a molecular level, using several high heat fusion methods. The combination of the minerals and the fusion techniques produces a catalytic conversion of energy, developing a long lasting natural resonance which has the ability to be transferred to any liquid, renewing the natural molecular chains. The ‘beta’ rhythm frequency spins at an anti clockwise direction, and like other ‘energy waves’, it can ‘influence’ inert objects. For instance, a magnetic field can influence metal objects and an x-ray can influence film strip. Likewise, beta rhythms at the correct frequency and spin velocity will liquid. What kind of minerals are in the AM- Wand? How many of them? The body of the AM-Wand houses 11 minerals locked into it by high heat fusion techniques and is technically engineered. Each mineral grain has its own individual shape and size that when combined with the other minerals, through a catalytic conversion, generates the spinning resonance we call chi energy. How does the energy transfer to the water using the AM-Wand? The AM-Wand energy spins into the liquid, counter clockwise, or the liquid can be poured over the AM-Wand where it ‘picks up’ the resonance. The resonance generated is similar to that which is found in the earth surrounding many healing spring waters of the world. At the moment, scientists can’t understand why liquids behave differently and positively in the energy field. Much research is now focused on this fact as 70% of our bodies are made from water and it’s important to nourish the body with the correct molecular structured water. Is there any expiry date? What would be the effect after the expiry date? We expect the AM-Wand’s energy to last 30 years as recent tests on the original pre-production test units made five years ago show that they have increased in energy levels. Unlike a magnet, the resonance is not affected by the earth’s gravitational pull. When the AM-Wand fails, it will not have the ability to change the taste of any fruit or liquid. What are the benefits of AM-Wand? Molecular structures in liquids allow the taste buds to recognise only the taste we enjoy. For instance, any wine, alcohol, coffee, tea or fruit juice will enhance the flavor when a AM-Wand treats the liquid. Any food we consume with Nanonized water will always taste better. Mixing Nanonized water with a beverage reduces the effects of acidity and tannins in the body. When food or medicine is combined with Nanonized water, the nutritional benefits are amplified by enhanced cellular absorption. The body can absorb liquefied oxygen very quickly, enhancing internal organ functions and adding to blood energy levels. This benefit is important for athletes and workers who need to maintain a high immune system under physical stress. When drinking Nanonized water, the blood’s oxygen levels increase. This can be measured using a Medec, Prognos or simple blood sampler. The wellness of Nanonized water drinkers will be that they have increased energy levels and raised immune systems. The body can take up other essential minerals from Nanonized water. The body’s molecular structure can rapidly absorb the nutrients found in the Nanonized water’s molecular structure, as the body’s molecular structure via D.N.A. ‘links’ with the water mineral molecules. This effect feeds the body cells with essential minerals. As the water’s molecular structure does not break down, it can also absorb cellular waste, such as cholesterol and excess calcium, improve bowel movements and the dissolving of kidney stone, reduce cholesterol levels and a general detoxification of the body can verify this. Individual minerals such as calcium can be taken up by the body cells as required. Quicker and stronger nail and hair growth improved and an enhanced resistance to tooth decay can visually evidence this. When Nanonized water is used in conjunction with supplements, they are absorbed more quickly and efficiently by the body cells, an important aim for dietary. For more effectiveness, point as close as possible or lightly touch with the wand. Use the Nano Wand on face to rejuvenate the skin. Use the Nano Wand to energize your food and water. You may also stir liquids with the wand (with proper hygiene) or rotate it above your drinks or food to energize them. The energy created through the wand specifically rejuvenates molecular structures in liquids and foods. The molecular structure causes any liquid or food to become more hydrating, taste better and extend shelf life. The renewed molecular chains are similar to those found in healthy natural spring water. Like fruit and vegetables, our physical body slowly loses molecular chains as we age. They can be re-energized at a molecular level using the Wand. Water energized by the wand improves oxygen flow to the blood. This can be measured using a Medec, Prognos or simple blood sampler. Energized water also assists in detoxification of free radicals, improves liver detoxification, and improves nutrient intake by the body. Mixing Wand energized water with a beverage reduces the effects of acidity and tannins in the body. When food or medicine is combined with Wand energized water, the nutritional benefits are amplified with enhanced cellular absorption. Next move the wand from the base of the neck to the chin and jaw in straight upward strokes. NOTE: Tip of wand is laying flat on the skin for all upward strokes. Use upward strokes only. You will feel the difference in the firmness of your skin within minutes of doing this. The skin feels tighter but in reality it is the releasing of the facial muscles causing the skin to feel relaxed, especially the cheek muscles. Experiment with doing one minute in each area and the 3, 9, 18 method. To energize the environment in which we live. Keeps overall body energy level at optimal.